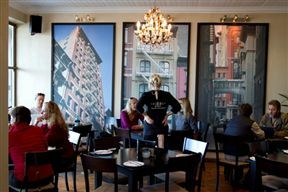 With the renowned restaurant district in Tribeca, New York, as its inspiration, interiors at Tribeca Bakery include photographs of the New York skyline and scenes from the vibrant city. 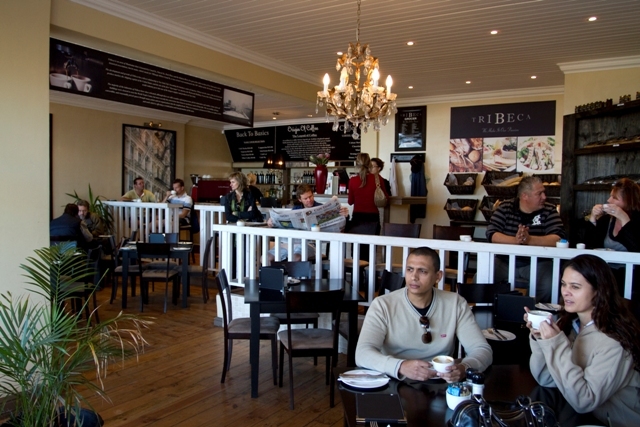 Situated in the middle of the Main Road in Kalk Bay and facing towards the sun, this light filled coffee shop is always bustling and inviting. Tribeca has it's own bakery on site, making freshly baked goods daily which are displayed in the windows facing passerby's. Shelves heave under the weight of pretty cupcakes, fresh croissants, muffins and decadent sandwiches. When not indulging in speciality coffees and baked goods, patrons can enjoy a creative menu with a great selection of salads, open sandwiches and delicious meals with a fresh twist. Try the coffee cocktails if you're feeling adventurous and want to experience a caffeine kick in a new and interesting way. 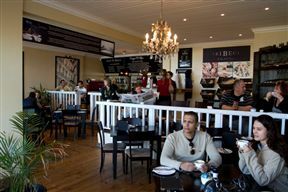 Tribeca Bakery is 22.4km from the centre of Cape Town , the nearest airport 24km (Cape Town International Airport).